ZTE Grand Memo, which is all set to be made official at the upcoming Mobile World Congress has been teased by the company at an event held at Hong Kong. The ZTE Grand Memo is said to sport a 5.7" 720p display, Snapdragon S4 Pro chipset with a 1.7 GHz quad-core processor as well as a 13 megapixel camera. 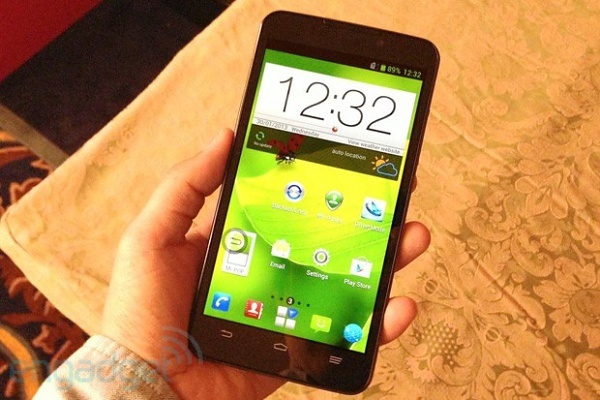 The phablet runs on Android 4.1.2 Jelly Bean and has an 8mm thick body. Furthermore, the phone is said to include a microSD card slot and features the "one-hand" T9 keyboard. The folks at Engadget were able to get their hands on the device and they claim the device looks identical to the P945, with all of the changes happening under the hood. ZTE will also be bringing another smartphone called Mozilla to the MWC. ZTE Mozilla as the name suggests, will be powered by the Firefox OS. ZTE's launch event has been scheduled for Monday, February 25 the official hash tags for the announcements have been declared as #ZTEGrandMemo and #ZTEMozilla.